BEIRUT, Jan. 14 (Xinhua) — The Popular Front for the Liberation of Palestine (PFLP) announced Wednesday that it supports any military action against Israel from Lebanese territories, in retaliation for the Israeli war on Gaza, local Elnashra website reported. “The front supports any military action from Lebanese territories against Israel in retaliation for the crimes committed by Israel against the Palestinian people in Gaza,” PFLP political bureau member Abu Ahmad Fouad said in a statement. He added that Hezbollah is closely following up the situation in Gaza, and has a working plan accordingly. “Hezbollah is on a high state of alert to support Gaza at the right time, and in coordination with the Palestinian factions,” he said, stressing full support to Hezbollah’s decision. The statement was released following a rocket attack against northern Israel this morning from south Lebanon, which prompted an Israeli response by firing back artillery shells on southern areas. Hezbollah denied any involvement in the rocket attack, while fingers were pointed at radical Palestinian factions including PFLP. TEHRAN, Jan. 12 (Xinhua) — Iran’s government warned that companies of foreign countries dealing with Israel would be punished, Iran’s satellite Press TV reported on Monday. 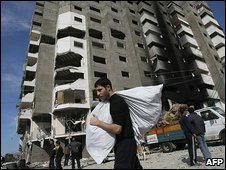 The report added that there would be punitive measures for those companies if the Iranian parliament passes the bill. Since the Israeli offensive on Gaza began on Dec. 27, 2008, Iran has uninterruptedly condemned the “Zionist regime’s crimes on Gazans” and has incessantly called on the Arab states to break silence in favor of Gazan people. Some Iranian officials have also asked the oil-rich Muslim countries to use the oil weapon as a means of pressure against Israel. 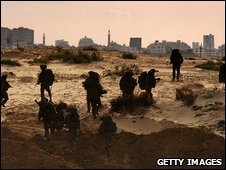 About 900 people in the impoverished Gaza Strip have been killed and more than 3,500 others wounded since the launch of the Israeli raid, which it said was aimed at revenging Hamas rocket and mortar attacks. Hamas is an alliance with Iran which does not recognize Israel as a state of the international community. RIYADH, Jan 12 (Reuters) – Saudi Arabia accused Israel on Monday of “racist extermination” in its attack on Gaza and expressed hope that incoming U.S. president Barack Obama would work to end the Israeli-Palestinian conflict. “The cabinet said the extermination Israel is launching upon the Palestinian people in Gaza has denuded Israeli leaders of humanity and places their policies in the ranks of racist extermination,” said a statement carried by the state news agency SPA. Medical officials said the Palestinian death toll in Israeli offensive, which began on Dec. 27, had risen past 900 and included at least 380 civilians. Israel says 13 Israelis have died — three civilians hit by rockets and 10 soldiers. Obama said on Sunday the deaths of civilians in the fighting were “heartbreaking”, and that his administration would act immediately as a third party that wants to see a fair resolution to the historic conflict. The Saudi statement said that the cabinet “looks forward to an incoming American administration that is more serious, objective and independent in dealing with the Palestinian issue”, SPA said. Arab governments have long complained that U.S. administrations lean towards Israel in the conflict. Saudi Arabia has organised an aid campaign for Palestinians that has gathered over 100 million riyals ($27 million), as the government tries to respond to popular anger over the offensive while preventing street protests. RIYADH (Reuters) – A Saudi aid campaign for Palestinians wounded in Israel’s assault on Gaza has gathered over 100 million riyals ($26.7 million) as the government tries to respond to rising popular anger over the offensive. Saudi state media has carried prominent coverage of three dozen wounded Palestinians brought to the country for treatment in Saudi hospitals and reported a 30 million riyal donation to the state-run aid campaign by King Abdullah. But this “protest by charity,” as al-Riyadh daily called it, is the only protest to be found in the conservative kingdom, a lynchpin of U.S. policy in the Middle East that has tried to contain the threat of demonstrations. The absolute monarchy has no elected parliament or legal opposition and public protests are generally banned. Minority Shi’ite Muslims in eastern Saudi Arabia say dozens were arrested after a street protest days after Israel began its Gaza offensive on December 27 and that police broke up a second one with rubber bullets and batons. The protests were reported on a Shi’ite website banned in Saudi Arabia, while the government denied they took place, citing a ban on such activities. Two political reform activists were detained for trying to hold a sit-in in Riyadh two weeks ago, independent group Human Rights First said in a statement sent to news outlets. “They considered it a legitimate right,” said a colleague who requested his name be withheld for fear of arrest. He said the Interior Ministry refused to grant permission for the sit-in.